Adrienne, though, ignored all of us, because she was kind of a snob. She only wanted to work with high profile amputees: special-forces soldiers or West Point officers. As for me, I didn’t want to get more stressed out than I already was. I just wanted an “easy” patient. Hopefully a single amputee, minus the additional traumas like fractured limbs or brain injuries that usually accompany a survivor of an explosion from an imporvised explosive device, or I.E.D.. Except that, even when I did get my dream patient, a friendly young man whose one leg was taken cleanly off by 50-caliber fire, he was plenty messed up. I hadn’t added the unpredictable factor of post-traumatic stress syndrome, or P.T.S.D., into my equation for patient success. While I believe all of our patients had it, you never knew who was going to have it the worst. Though I no longer work there, it’s hard to work the Walter Reed out of me. I worry that I will never feel as alive or as needed as I did back in our old clinic after the American troop surge in Afghanistan, when we were treating 150 amputees a day and having nightmares all night. And, it’s true, I’ve struggled to hold onto jobs since. After being employed at Walter Reed for nine years, now I can’t seem to commit to anything. I bounce from part-time job to part-time job — the reason I had put myself through physical therapy school in the first place. That I’m right back to where I started feels familiar to me in a good and frightening way. In between gainful employment, I pick up odd jobs like house painting and my one regular but strange gigs: a fit middle-aged woman who pays me cash to come to her house and give her a foot massage. While she is a good conversationalist, smart and witty, there is something about this weird job that leaves a stain on my psyche. After treating combat amputees for most of the last decade, many of my former colleagues struggle with the same thing. One went back to school for a new career. One had a breakdown. One is trying to sell picture frames on Etsy. Our old supervisor, who had kept all of us going and worked 16 hours a day, is now a dog walker. Weddings are funny places because they seem to inspire all sorts of sentimental thoughts. I remembered a story a young lieutenant told me after he attended a friend’s wedding shortly after leaving a leg and an arm behind in Iraq. It was the first time since his injury that he saw so many of his old friends again. Sitting at the reception table, he felt suddenly shy. His prosthetic arm, well, that was obvious. But his prosthetic leg was hidden under the table. My friend, the lieutenant rolled up the trouser sleeve covering his non-injured, fully intact leg. The lieutenant came back from that wedding with a bounce in his step. He was not a victim. He was a victor. And that’s the one thing that makes me glad — that while the staff may be on a temporary downswing, our patients, for the most part, are doing well. At Walter Reed, we were all a bunch of strangers thrown together in an out-of-this-world situation. But back to ordinary life at a wedding, discovering that a man who I would have known as a “triple” back in the day, is just another high-speed businessman in Washington, D.C., makes all those years totally worth it. That I am familiar with him but not his amputations makes me realize that in spite of everything, we really did see each other for the individuals that we were. Although I wish more than anything that he didn’t have to get hurt in order for me to recognize that I know his face better than his injuries. 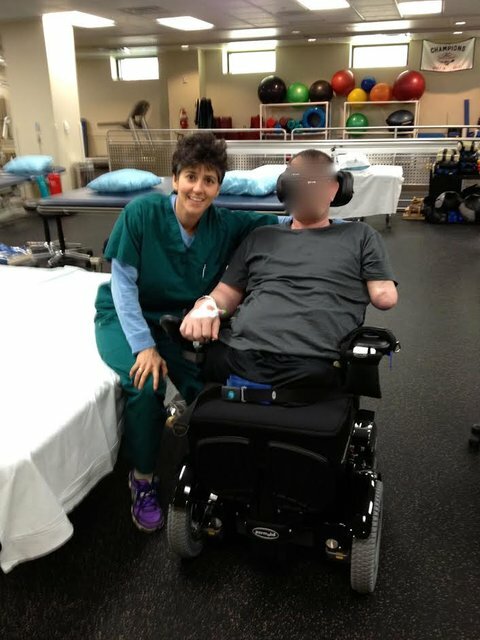 Adele Levine worked as a physical therapist at Walter Reed from 2005 until 2014, and is now a physical therapist working in Maryland. Her writing has appeared in The Washington Post, The Washingtonian, Narrative.ly, Signature and Psychology Today, and she is the author of “Run, Don’t Walk: The Curious and Courageous Life Inside Walter Reed Army Medical Center.” Follow her on Twitter: @PTAdele.